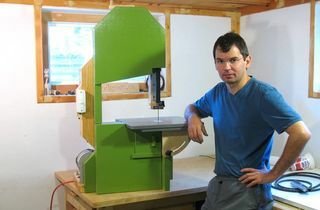 I produced an extensive series of articles and videos on building my 14" bandsaw. For the most part, my 14" bandsaw is a smaller version of the 16" bandsaw, so the videos can also be used as a guide for constructing that one. 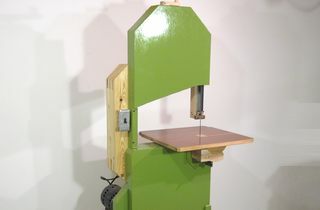 However, the 14" bandsaw uses hinges to tilt the tables, and thus lacks trunions. So I figured I'd fill in the gap by writing an article about how to make those. 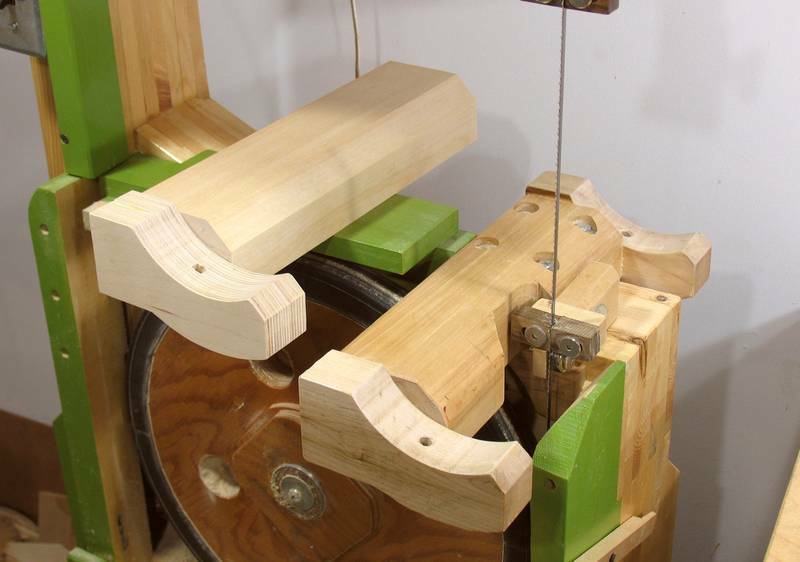 This article covers a slightly improved method over how I built the trunnions in the 16" bandsaw, but it's still based on the same plans. 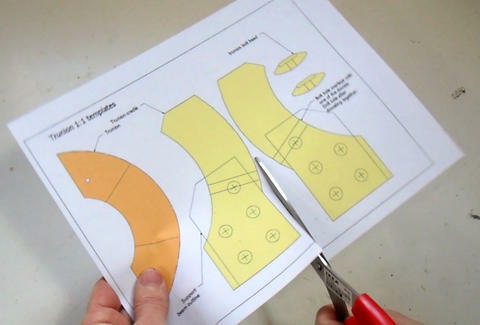 I start by cutting out the trunion templates from the 16" bandsaw plans, leaving about 3mm of margin all around the templates. Then I trace the outline (with the extra margin) onto 3/4" (or 18 or 19 mm) Baltic birch plywood. I added the 3 mm margin so that I don't have to be super precise on gluing. 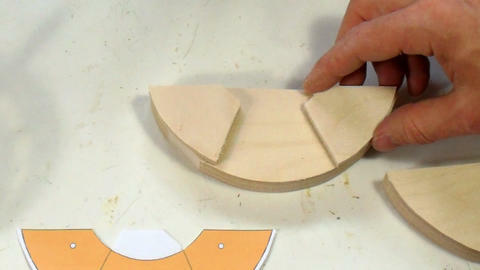 I only cut it to its final shape once all the layers are glued. 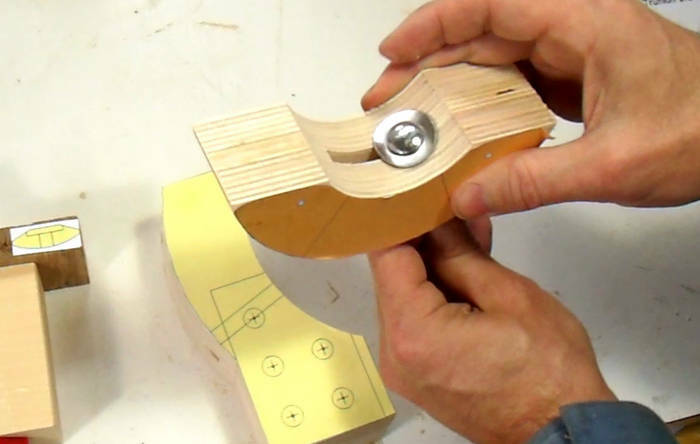 If you don't have access to another bandsaw while you are building your bandsaw, you can temporarily clamp a (non-tilting) table onto the saw's frame so that you can still use it to cut out these parts. 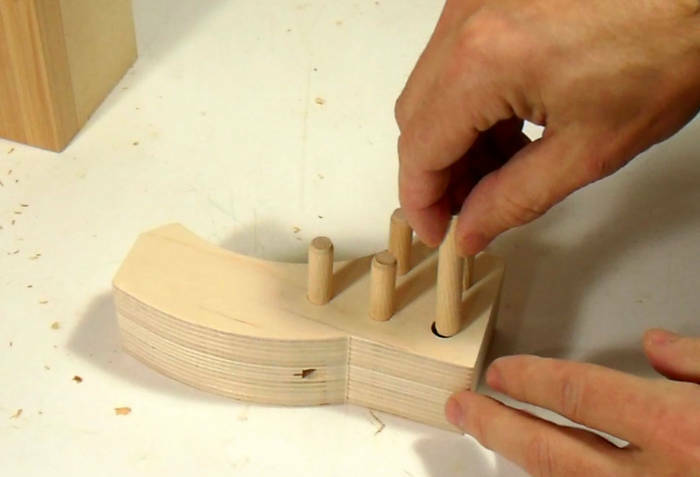 The trunnion cradles are made of three layers. 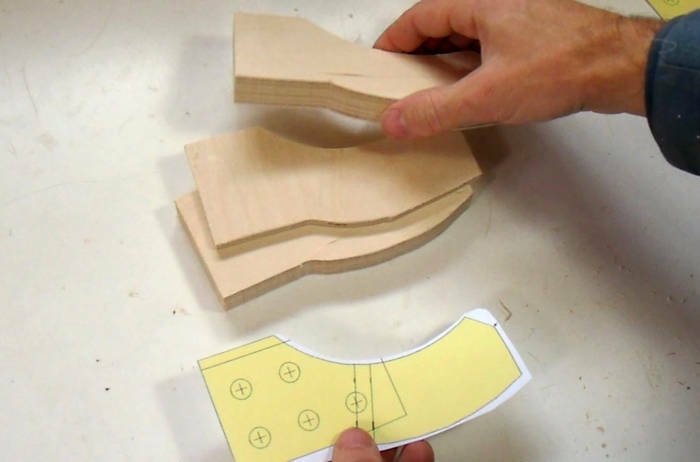 The middle layer is 1/4" (6mm) or slightly thicker. 8 mm would work too. 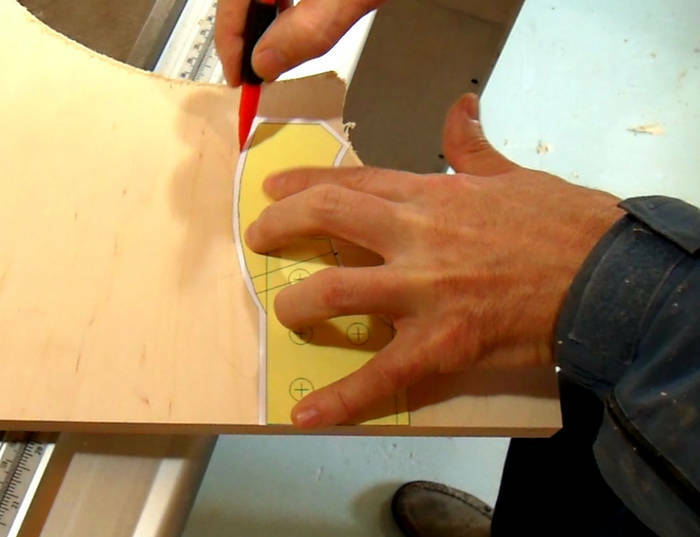 If you don't have 1/4" thick plywood, it's ok to use solid hardwood for the middle layer. The middle layer needs a slot cut out of it for the bolt to go through. 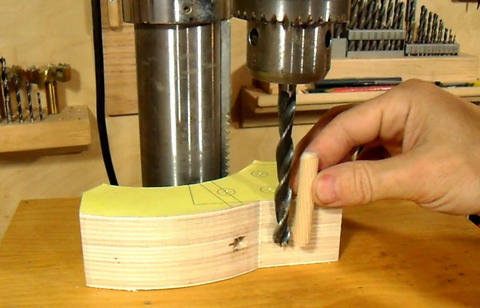 Cutting that slot before assembly eliminates a tricky drilling step later. 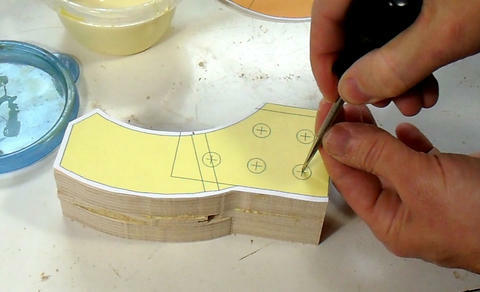 With the middle layer cut in two, gluing the layers together. 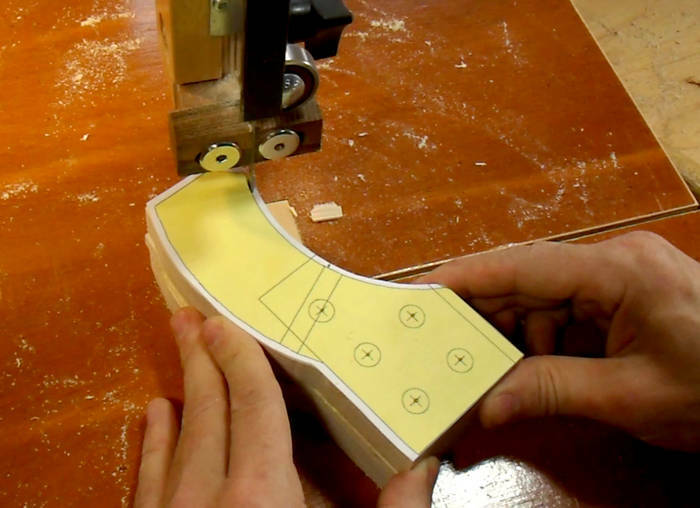 The same layered approach is used for the trunnion arch. 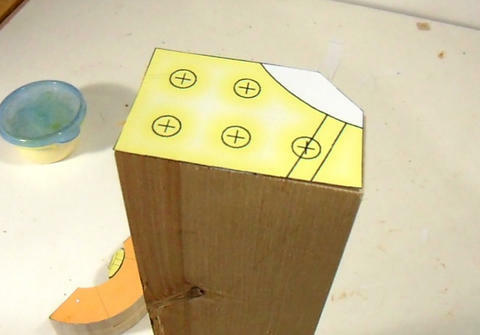 The middle layer has a large section missing to accommodate where the bolt swings. 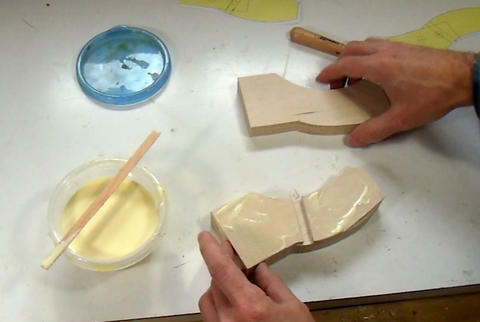 After the plywood layers are glued, the template is glued onto the wood with a few dabs of glue. 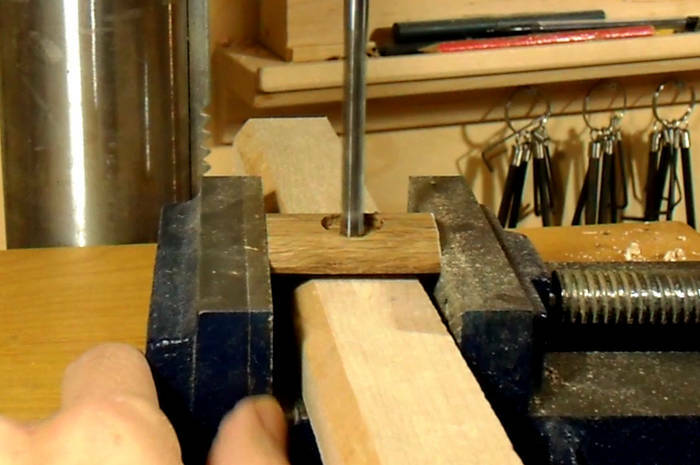 Next I use an awl to punch through the centers of the dowel positions. I'll drill these out later, but I'm punching them now just in case I mess up the template. 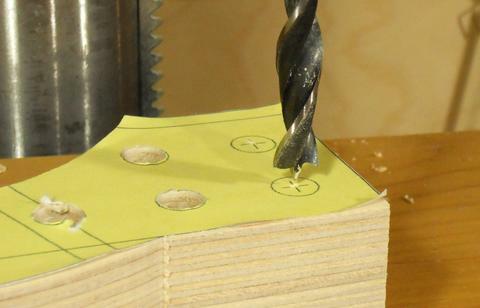 Drilling must be done last, because the drill may catch the template and pull it off the wood. 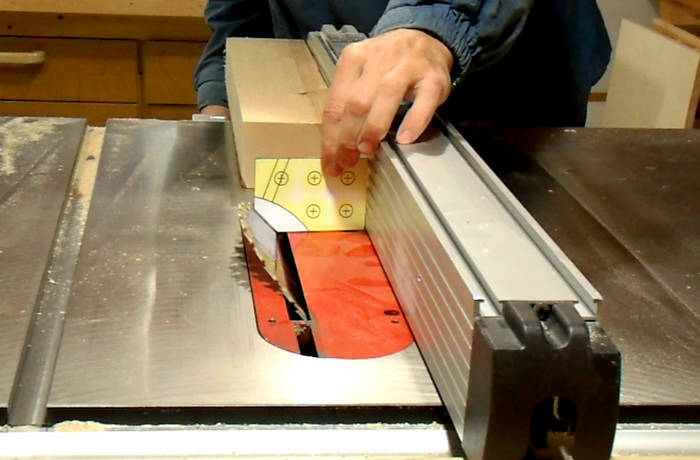 Now cutting the trunnion cradle to it's final dimensions. This has to be done very accurately. My bandsaw blade was actually a little dull when I did this. So it cut quite slowly, but that's actually good in a way - forces me to go slowly. Checking the fit. So far so good. 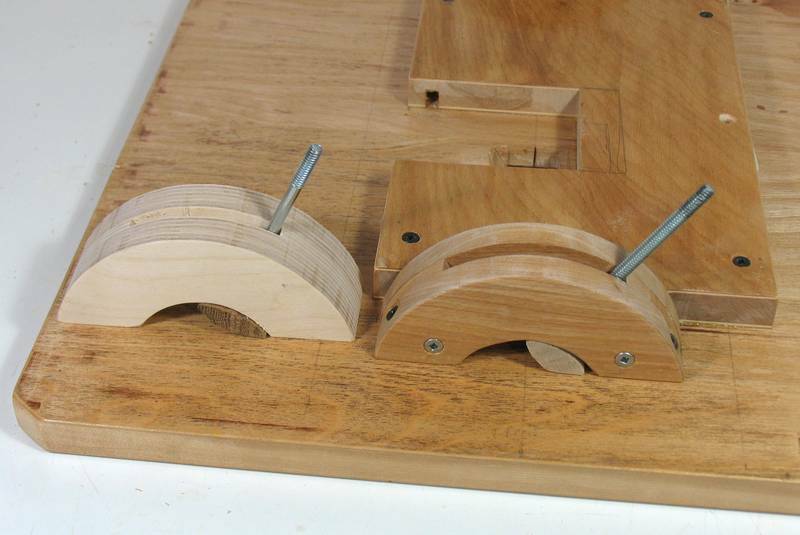 The trunnions worked pretty good even before sanding, but sanding certainly helps to smooth the action. When I built my 16" bandsaw, I finished the trunions with a slippery varnish to make them glide more easily. But that turned out to be a mistake. They slid far too easily, and I had to roughen them up to be able to lock the table effectively. I experimented with using a washer to fit on the end of the carriage bolt. I started with a washer with a hole just smaller than the carriage bolt's square section and filed the corners so it would fit. Then I bent the washer to fit the curve. This would be an adequate solution, though you have to start with just the right washer. It's important that the washer keeps the carriage bolt's head from turning. So you could build it this way, but for this example, I'll build it the way I built my bandsaw. 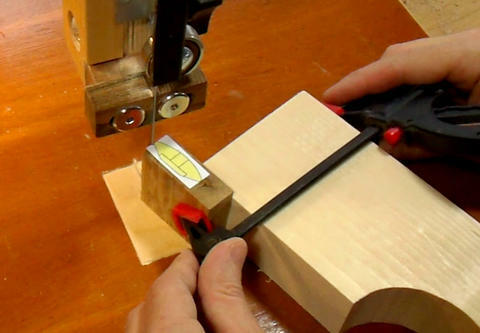 Here I'm cutting the piece of wood that the carriage bolt head fits into. 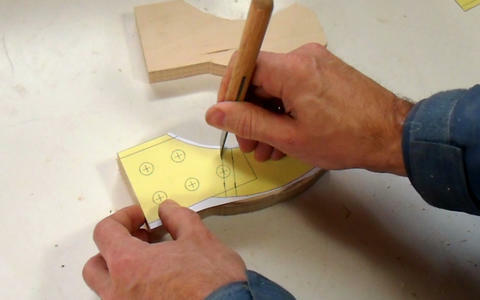 The wood needs to be oriented vertically, so that the template is on the end grain. 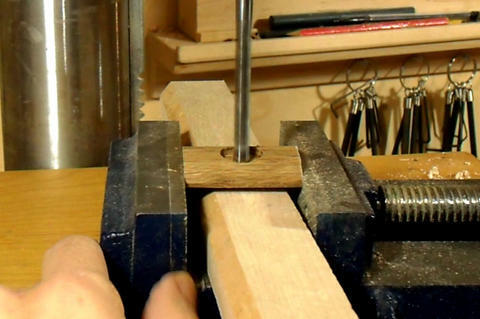 I clamped the workpiece to a large piece of wood to help stabilize it. With the piece cut out, I drilled a larger hole for the bolt head, then a 1/4" hole though for the bolt. Filing the hole square to accommodate the square section of the carriage bolt. 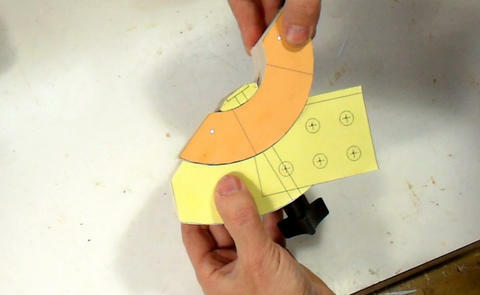 A test fit, it glides smoothly. 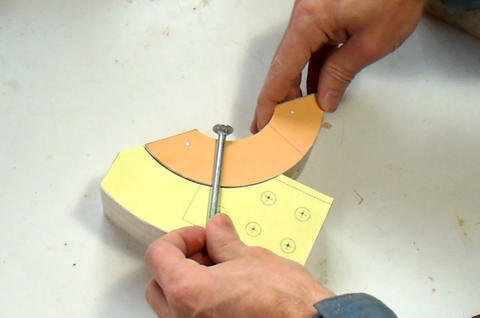 Checking the blade and fence position for cutting the bevel on the trunnion support beam, using another cut out template. I glued the template to the end of the beam for marking where to punch the holes. 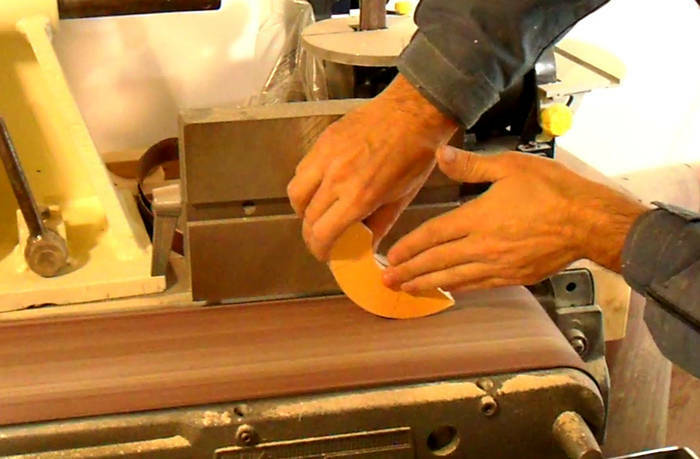 This process works very accurately for closed grain woods. 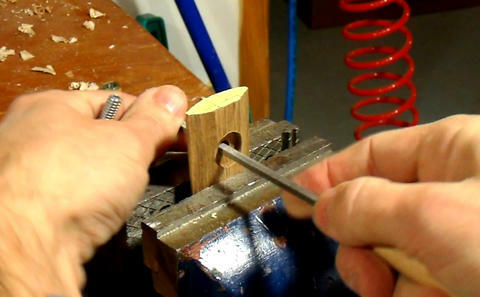 For woods such as ash or oak, the awl will often move to the side as it follows the grain. The same is true for some soft woods, though you should be using hardwood for this part. Checking the drill depth for drilling the holes in the trunnion support cradle. 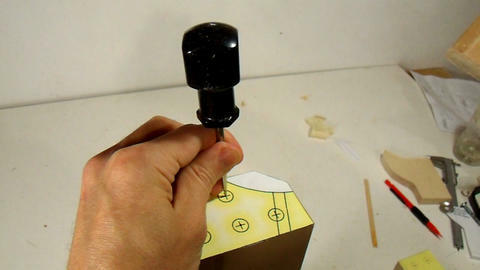 I'm using 2" pre-cut dowel pins, so I need to drill 1" deep in each part. The awl-punched holes really help to guide the point of a brad point drill bit, even if the drill wobbles a bit before it enters the wood. ... and a fit check - perfect! 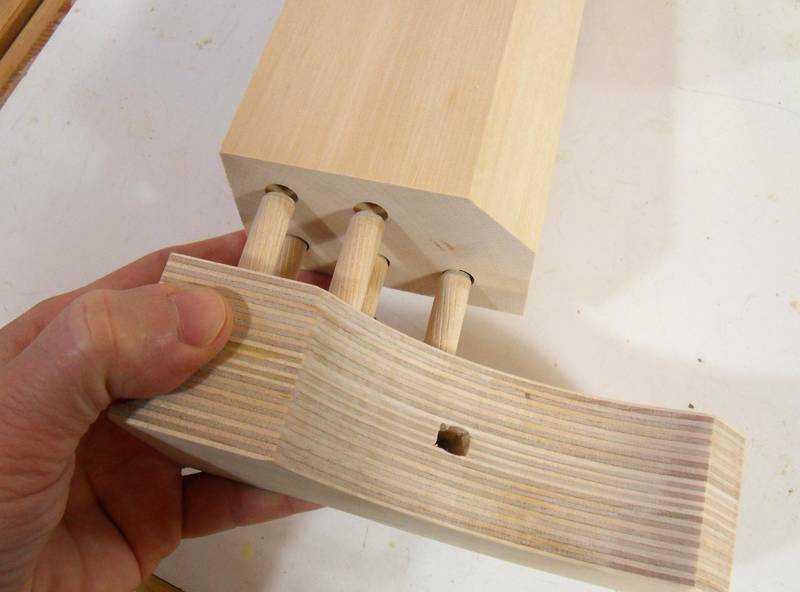 There are all kinds of jigs out there for aligning dowel holes, but I have had good results with this method. I have a horizontal boring machine for drilling precisely indexed holes, but it's hard to justify the effort in setting it up considering how well I can do without. 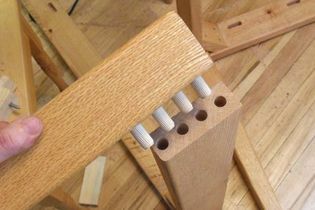 One of the dowels interferes with the hole for the bolt. 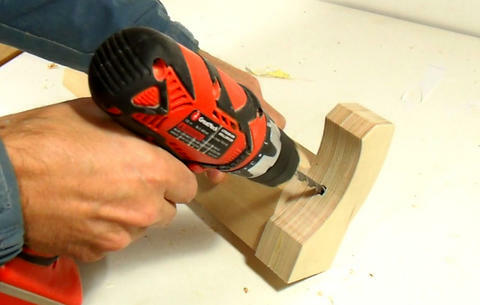 You could shorten that dowel, or just use a hand drill to re-open that hole. And here's the trunnion beam, next to the trunnion in my bandsaw. Here's the arch of the trunnion, next to the one in the table. 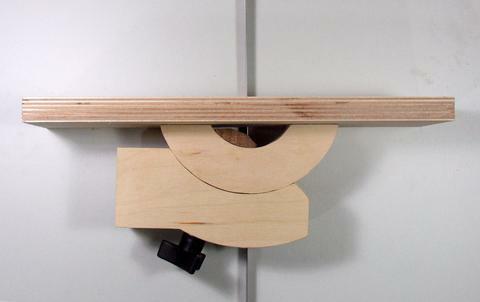 I'm not building another bandsaw right now, so this is as far as I'll take that one, but I hope this makes clear how to make that part.